Want to get to know your co-workers better? Find out what color of licorice they prefer. You'll be surprised to find out that red licorice eaters and black licorice eaters have very different perceptions of themselves. At least that's the conclusion of a survey conducted by the American Licorice Company, in celebration of National Licorice Day (April 12). The makers of Red Vines twists posted a Licorice Personality Quiz on their Facebook page, and the hundreds of licorice eaters who responded showed distinct characteristics. The quiz results show that those preferring red licorice see themselves as sensible, practical, and down-to-earth. They describe themselves as more pragmatic and conservative than their black licorice counterparts. They tend to be more methodical, and like to have things planned instead of leaving things to chance. 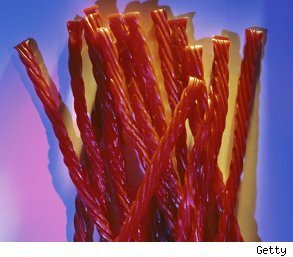 Conversely, fans of black licorice consider themselves more "wild and crazy" when compared to those who prefer red. They like spontaneity and enjoy the thrill of adventure. They're more likely to be outspoken, freely share their opinions with others, and often feel as though they're going a million miles an hour. "Interestingly, one thing both groups had in common was that they described themselves as more 'jeans and a t-shirt' types than 'designer.' Maybe that means licorice is the ultimate comfort food," observed American Licorice Company's Consumer Communications Manager Michael Kelly. There are, of course, many exceptions to theses findings -- what about those who prefer the more exotic colors like green and purple? And those who don't like licorice at all? No matter the results, this might be a fun topic of conversation around the water cooler. Or a good excuse to thank a loyal colleague with their favorite type of licorice.